The rate of change of technology over the last few decades seems to be even faster than any time before. It is not that surprising, and it is clearly an interesting time in which to be alive. I recall a conversation when I was younger with someone explaining that there was (of course) a time before traffic lights when busy junctions had a policeman directing traffic. It is interesting seeing old films that show that, and some horse drawn vehicles. What I find especially interesting is technologies that are vanishing from the face of the earth so completely that anyone younger than a certain age has no clue what the hell you are talking about. Things like the "Phone box" are vanishing quickly. The rotary dial telephone is so unusual there is a whole generation that would have a had time recognising it as a phone, let alone using it. And an audio cassette tape would baffle them. I have heard people very confused by the concept of paper maps even! It is especially interesting when you have technology that was new when I was younger and has now almost completely vanished in just a few short decades - like the "CD". Watch Back to The Future II - it amusing how they assume CD and video disks will be with us so much in 2015 and still have phone boxes! The barcode number plate is especially amusing - realising that a machine readable ID is needed in the future but not realising that computers will be able to read letters or more likely that cars will all have real time wireless location reporting as a normal feature some day. I was today trying to clarify some artwork for an engraving job, and got the very sensible answer: "The notch goes at 9 o'clock". But it struck me, I am not sure my kids would know what was meant by that phrase. A "traditional" analogue clock face is getting rarer and rarer these days. It won't be long before phrases like "I've got your six" lose all original meaning and become one of those strange quirks of English (or possibly American) language. As I say, an interesting time in which to live. Wait 'till next week and the watch will be on everyone's wrist again! I might get back into the habit of wearing a wristwatch - if I can find one that I actually like. 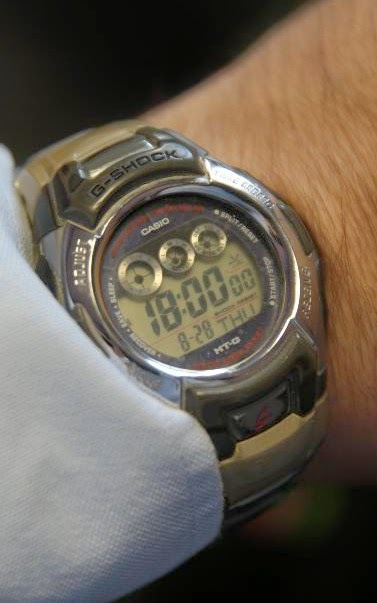 For me, multiple timezone support and an analogue face are essential - for quite a while, I wore a cheapish Timex which had two timezones on the digital part and could support a third on the analogue face - but that combination of features seems to be rare. Douglas Adams had it right when he wrote disparagingly about "digital watches being a pretty neat idea". At least, when it comes to pure digital watches. It's impossible to read them one-handed in the dark. Actually my watch has a thing where you flick your wrist and the light comes on. Wow - it's the modern day equivalent of cornflakes. Citizen Ecodrive with radio control, timezone & summer time support, perpetual calendar and solar power. Titanium version is lighter than most "womens'" watches. Absolute winner. I'm very pleased with mine. Paper maps still have their place. They can display far more information on one page in greater detail, and they still work when my iPad battery has gone flat. Maps are one of those key things that you need to work or you're lost (sometimes literally). I'm still wearing one of Casio's solar powered sailing watches, it's been on my wrist for 5 years now and auto-updates the time by radio at midnight. But being a gadget fan I do like the idea of these new Smartwatches too, such as the Moto 360 and LG/Samsungs 2nd generation TBA Android Wear kit. It will be interesting to see what Apple comes up with too, but I suspect they'll hobble it with iDevice-only compatibility or something. The one big problem with Smartwatches though is that most have terrible battery life and seem to be using unnecessarily powerful CPUs. I can stomach having to re-charge my phone every couple of days.. but my watch too? NO. It needs to last at least a week on a single charge, ideally two. The Pebble watches can do that but they’re not to my taste of style or functionality. I need to get my watch (an automatic wind mechanical one) serviced. As for "o'clock" positioning, I use that with my car adaptation fitter - asking for the steering knob to be at ten o'clock. You still hear driving instructors talking of "ten to two" or "quarter to three". Mid-forties here, grew up with dial telephones, vinyl records, cassettes and wind up analogue watches (which I prefer), and OS maps knock socks off any digital map, but I must admit I had to google 'I've got your six'. Never heard that phrase before. I was watching an old episode of Futurama the other day.. apparently floppy disks will be making a comeback by the year 3000! I've got your six is a military term, and is short for someone keeping your six o'clock covered. In other words, they've got your back. I've not worn a watch for years, I rarely need it, my phone has a clock on it, my cars have clocks on the dash, my desk phone and computer have clocks and date readouts, so why carry something else I don't need? The term derived from the use of the clock-face as a shorthand for direction, particularly in aviation where there was much less time to react than on board ship (where "off the starboard bow" was still entirely usable). "Bandits, twelve-o'clock high" meant enemy aircraft, directly ahead and at greater altitude. When does the taste not matter? Why did I buy a Makerbot Z18? Does John Doe not work there any more? The use of complaining to BT plc?